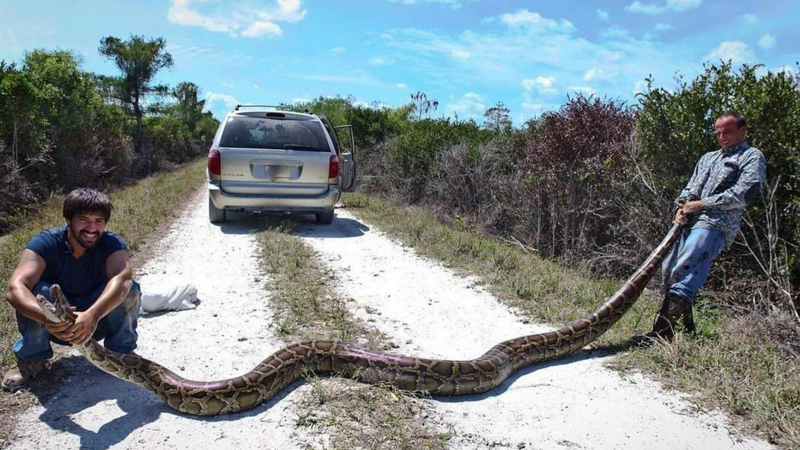 The HUGE python weighed an incredible 144 pounds. Two snake wranglers stumbled across one of the biggest snakes loaded has ever seen caught on camera recently, after discovering a terrifying 15-foot python. Trapping partners Nicholas Banos and Leonardo Sanchez discovered the beast at the Everglades National Park in Florida recently, and the pictures of the creature quickly went viral. It all happened after the pair were making their way on their daily patrols when Sanchez spotted something moving in the bushes. They quickly stopped, and ended up finding the snake – which weighed in at a hefty 144 pounds [10 stone]. After a struggle, which saw Banos climb on top of the beast to suppress it, the snake was bagged up safely. 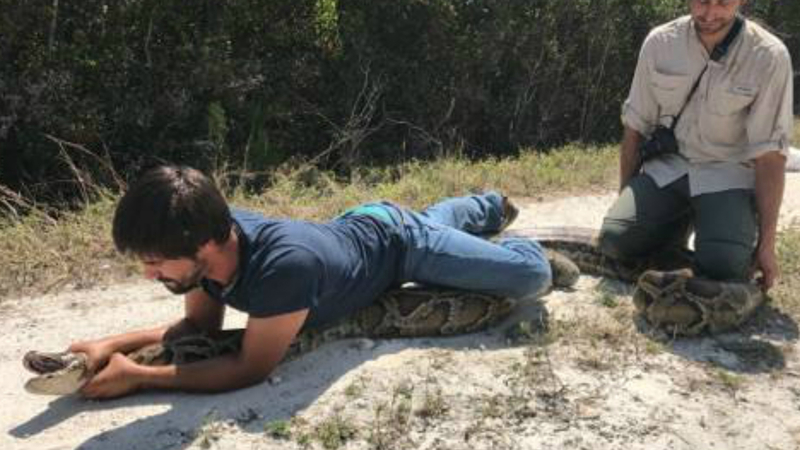 Banos told WSVN that the encounter was a satisfying one, but admitted that it had also been ‘a little bit of heartbreak’ as the python was later euthanized. The trappers’ job is to find and kill pests in the area, and so the snake was later killed by the trappers. Nicholas and Leonardo are two of the volunteer trappers working through a programme run by the South Florida Water Management District to try and reduce snake populations in the area. It sounds like a pretty stressful job. After all, loaded certainly wouldn’t fancy capturing deadly animals for a living. It’s the latest shocking snake story from recent weeks, after a man was found swallowed whole in the belly of an enormous python.